Whynter - ARC-08WB : Portable Air Conditioner Review • The Air Geeks, reviews of air conditioners, dehumidifiers and air purifiers. The ARC-08WB is an air conditioner that offers a cooling capacity of 8K BTU. This unit is engineered for three functions : to serve as an air conditioner, a dehumidifier, and a fan. In addition, this portable system features a highly effective self-evaporative system that exhausts most of the condensate. Easy to install and to use, this unit comes with a full-function remote control that allows users to adjust various parameters without having to walk to where the unit is positioned. Its small reach and compactness make it ideal for living rooms, bedrooms, office stalls, and computer rooms to name a few… Or is it? Let us find out more. The ARC-08WB is an 8000 BTU air conditioner that is optimized for relatively small rooms. Its capacity and compact design (it measures 17 by 28 by 13.6 inches and weighs 64 pounds) along with its relatively limited power and price tag are good arguments if you’re looking to cool a small apartment, for instance. This portable air conditioner is designed to offer four operational modes: cool, fan, dehumidify, and “auto”. With these modes, you are prepared to most weather fluctuations. How powerful is dehumidification, you ask? As you guessed, not very : it is designed to deliver a dehumidifying capacity of 45.6 Pints / 24 hours. However, our tests only recovered 15 pints in a day. A portable system is ideal for places where permanent installations cannot be made. This system does not require permanent installation and it is suitable for people who like moving their unit from one position to another. To enhance mobility, it features caster wheels therefore eliminating the need for lifting its 64 pounds. Users can easily and effortlessly wheel this unit from one room to another with convenience. But let’s go deep in the ecological stance. It is true that most air conditioners are known to have negative impact on our environment. This portable system uses environmentally-friendly refrigerant, CFC-Free Refrigerant (R410a), and it therefore does not pollute our surroundings. In addition, this compact unit uses RoHS Compliant Components that are free from pollutants such as lead. Furthermore, the power consumption of this air conditioner is relatively low. It has a maximum power rating of 910 W/8.2 A. These claims, however small, are genuine. In order to minimize the accumulation of the condensate, this portable unit employs a self-evaporative system that is designed to exhaust most of the condensate. In rooms with average ambient conditions, this system can exhaust everything. This means that the system can run for a long time without the need to empty the condensate from its tank. However, this system was designed with various considerations in mind. It offers both continuous and manual drain options to cater for high humidity areas where the self-evaporative system may not exhaust all moisture. The ARC-08WB comes with a full-function remote control that enables users to adjust it without the need to walk to where the unit is positioned. In addition, it features a digital thermostat, auto-restart, and a programmable timer. The auto-restart enables the unit to start automatically after a power outage. Its programmable timer enables it to start or go off at pre-set times. Most air conditioners use air filters to clean air so that room occupants can get cool and fresh air. This portable unit features a washable pre-filter that cleans air. In addition, it has an activated carbon filter that helps in air freshening. With these filters in place, users are assured fresh air that is free from dust and odour. Its wide temperature range (62°F – 88°F) and powerful airflow (159 CFM) complete the picture. One of the other nice features of the ARC-08WB is its quiet operation : its noise officially stays under 53.6 dB. However, our tests measured it just a little under 60dB, still a good improvement in comparison with most AC units. But… there is a catch! If you place it on some floors, like hardwood, it will vibrate in an unpleasant manner, which causes unpleasant noises! Highly effective system. When properly installed, the ARC-08WB is a very effective unit that delivers impressive performance. Most users agree that the system cools a space within a short time. Four operational modes. It is clear from reviews that most users are impressed by this design that makes this unit a multi-functional system. Easy and fast set up. Most users agree that it easy to install the unit. Incompatible window sliders. In most cases, the sliders only fitted after modifications were done - most standard windows are not covered. Unpleasant vibration in some cases. Users who have placed the unit on hardwood floors have expressed concern and they feel that the system vibrates excessively causing discomfort. 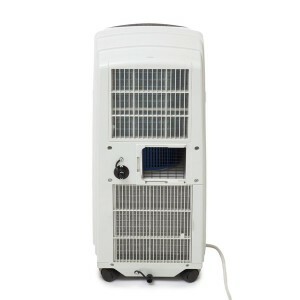 The Whynter Eco-Friendly 8000 BTU Portable Air Conditioner has several features. It can be used as an air conditioner, fan, or dehumidifier. You can pick the temperature you want for the air conditioner; the fan has three speeds: high, low, and auto. The portable air conditioner has a timer that you can use to set when you want it to turn on. It also has a sleep function that gradually increases the room temperature which decreases the noise level and conserves energy. I picked this air-conditioner to go in our spare bedroom/home office which is small but gets very hot in the summer. While the instruction manual says the window sliders are designed to fit into most standard vertical and horizontal windows, the sliders that were too small (using just one slider) or too big (using the two sliders) for the bedroom window which is a standard size. I ended up having to cut the slide bar to make it fit which worked out fine but kind of negates the whole idea of a portable air conditioner. Once I was able to get the air-conditioner up and running I was very happy with it. It is the perfect size for a very small room and does a great job cooling off the room I have it in. Yes, it is a bit noisy but I've yet to find a portable window air conditioner that isn't noisy. The Whynter Eco-Friendly 8000 BTU Portable Air Conditioner comes with the air conditioning unit, exhaust hose, sliding round adapter and flat mouth adapter, window sliders, clear plastic plug, foam seal, remote control, batteries, drain hose, activated carbon filter, and instruction manual." This is a very good small portable AC. I have 2 of its larger brothers and they are my favorite larger portable AC. This one is not as stellar as those in terms of function, but it does the job for small rooms just fine. I also have other small Portable AC units from Samsung and Honeywell which are also just as good and about the same price. I just tend to prefer Whynter because they have served we very well." The Whynter ARC-08WB portable air conditioner is <b>a compact unit that delivers a fair amount of cooling</b>. It is ideal for relatively small spaces since it has a low cooling capacity of 8000 BTU. This unit has four operational modes to cool, fan, dehumidify, or let the unit choose what to do in your room. However, the area covered is limited, and some details are room for improvement for the brand (like a better system altogether to manage evacuation).